My, oh my, it is HOT out there today. Two hot days in a row and there is more to come. Summer has arrived, baby! I made this sangria to help cool me down and it did the trick nicely. So delicious, so refreshing. Enjoy! 1. Combine all the ingredients in a pitcher and stir to mix. 2. Chill for at least 3 hours. Serve cold and garnished with watermelon slices. 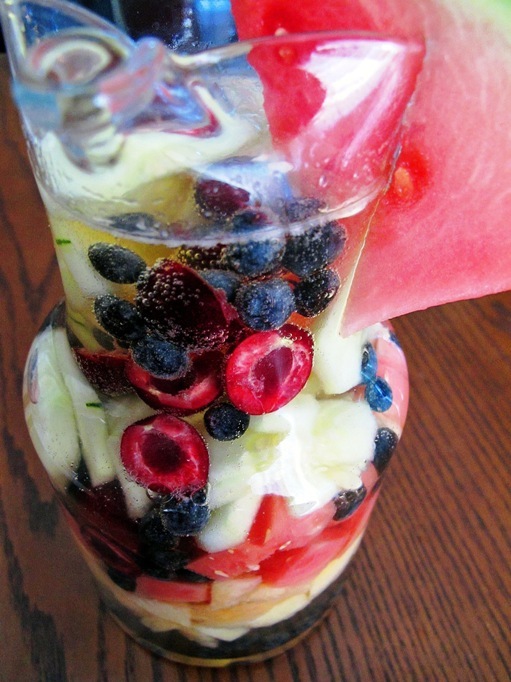 Really refreshing and good looking. The real danger with this sangria is the eating the drunken fruit...but I will take my chances. Oh thank you...loved the picture now can't wait to try it. I love the drunken fruit; heck I love a stupid vodka soaked olive...this will be to die for! Thanks Paula.. I've been thinking of this ever since you posted the picture on Twitter. I cannot wait to make it! I would love a nice tall glass of this! Glorious! I particularly like the addition of the cucumber. Have been putting slices of cuc into my water this summer... and it's so refreshing. mmmmm... perfect way to cool off in this heat! love all the berries you used, too!